Oh my..It's been some time since my last blogpost! What can I say, mommy duties keepin' me very busy these days. Did you guys miss me..??! I really wanted to share my second birthing experience with y'all and now I finally have the time! Wohoo! If you've never read my first birthing experience with Juhd, HERE it is. Honestly, I really wanted to wait for the baby to come naturally without being induced but doctors kept scaring me with horror stories of still births caused be overdue/prolonged labor. The first time with Juhd, I was also overdue and given 10 more days to wait for a natural birth. But that was only because at that time I didn't have GDM(gestational diabetes mellitus) or otherwise known as diabetes semasa mengandung. If you have GDM, doctors won't allow you to go beyond the 40weeks limit because risks of baby being too big and other complications that might be dangerous to the mom and baby. Anyway, the day I was scheduled for induction, we went straight to Hospital Putrajaya as I had a (considered) good experience there with my first baby. But when we got there we were told that there was no room in the hospital for anymore patients and that I'd either have to come back tomorrow or try a different hospital. I couldn't really decide so we went to eat and stroll in the park instead!LOL. As I was finishing my Nasi Goreng and Teh Ais(oh man sedap la pulak), I said to my husband 'Ok-lah, we go to hospital Serdang-lah'. And of we went to Hospital Serdang. Upon arriving, I could see the hall was quite crowded and the atmosphere was a little intense. One women was crying and holding her tummy looking like she was ready to give birth. Another pissed-off-looking man kept asking the person at the front desk if he could go in and see his wife. The person at the front desk was talking to people in a very annoyed tone. It was not a good start to my night at all. After checking in and waiting about 30mins, I was brought to a transition ward for monitoring of baby's heartbeat as well as a series of VE's. There were no signs of labor yet and my cervix was still closed. That went on for about 2 hours or so. It was 12 midnight. I told my husband to go back home since it was already late and I wouldn't be induced yet, at least not until the day after. 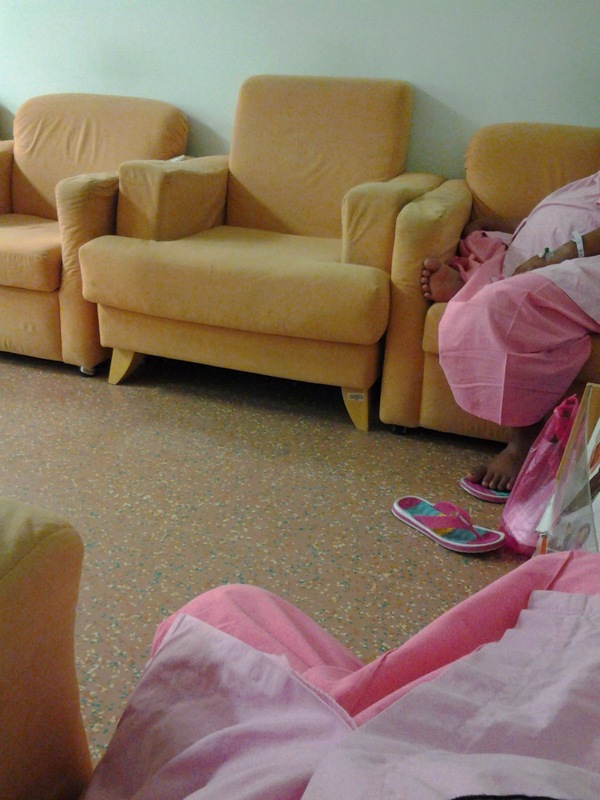 Just when I thought I was ready to be brought to the ward, I had to wait at another transition room with nothing but a few sofas because the wards were full. Basically I had to spend the night sleeping on a sofa. If you were a heavily pregnant lady, you would know how uncomfortable it feels to sleep in that position. Finally, after hours of waiting I finally got a bed in the maternity ward or whatever it is they call it. And that was basically approaching Subuh! At that point I was already tired because I couldn't sleep at all given the uncomfortable sofa to rest my head throughout the night. So I slept the whole morning once I got a bed. At 2pm, I was induced. After 20 minutes or so, the contractions came slowly. The first 4 hours of contractions was quite a breeze. Not that it didn't hurt, but this time around I was more prepared and really practiced my breathing techniques, and that helped a lot in dealing with the pain. At that time I could still whatsapp my friends, scroll down instagram and do a bunch of other stuff while 'layaning' the contractions. By 7pm, I couldn't eat anything because the contractions were getting stronger and really intense. My energy level also went down as I couldn't eat anything. I vomitted on my scarf. The nurses were not at all helpful as they just watched. When I asked for help to remove my scarf only then one of them came to my assistance. At that point my cervix had only dilated 2cm. By 11pm I was already silently screaming in pain. Doctors checked my cervix and I was 5cm dilated. Only at 12-ish was I brought to the labor room but I was left alone in the room with no one but a bell to ring in case I needed to call the nurse/doctor. My husband had also been informed that I was about to give birth but being wrongly informed by the security officer, my husband was told that I wasn't there and he was not allowed into the labor room. I rang the bell a few times and a nurse came with the worst attitude ever. I told her I was in so much pain and that I was ready to push but she kept scolding me saying that NO you're not ready to push yet without actually checking my cervix even once! Nurse : Puan..! puan jangan macam ni! *angry tone* Puan belum nak bersalin lagi! Me: Sakiiiit..dah tak tahan sangat2..saya nak teran..
Nurse: Puan..puan tahu kan bersalin ni sakit?! Puan jangan macam ni! Nurse: Puan..puan jangan macam ni! Puan belum nak bersalin lagi, puan jangan macam ni! Nurse : Ok puan angkat kaki dan pegang, puan cuba teran. So apparently my instincts were right. The moment I really wanted to push was the moment the baby's head was already coming out. The first push, baby almost came out but the push wasn't hard enough, so the baby went back in and I splashed water all over the nurse! It was indeed messy! The nurse didn't cut anything(no episiotomy) this time and with 2 very hard pushes, my baby came out under less than 3 minutes. Even the nurse said that was quick! That was my second experience giving birth. Quite horrifying to say the least. If you're planning on giving birth at a public hospital, please do consider other hospitals other than Hospital Serdang, especially if it's your first child. I understand that everyone's experience is different, but I've heard so many unpleasant stories about this hospital. I don't blame the staff for their poor service, I understand that their job is hard. And I respect all doctors and nurses for choosing to serve the people. I think the problem there is that the hospital's staff are overworked. That might be the cause of such poor treatment due to work stress. But seriously they should employ more staff so that nobody else will be the victim of over-stressed employees. Share your birth experience with me in the comment section! Was it a good or bad experience?? comel sgt! assalamualaikum baby qomar. masa juhd dulu, bersalin dekat HPJ kan? WoW it's been a while, I really missed your posts, but you are back and with the cutest achievement ever! Mashaallah! 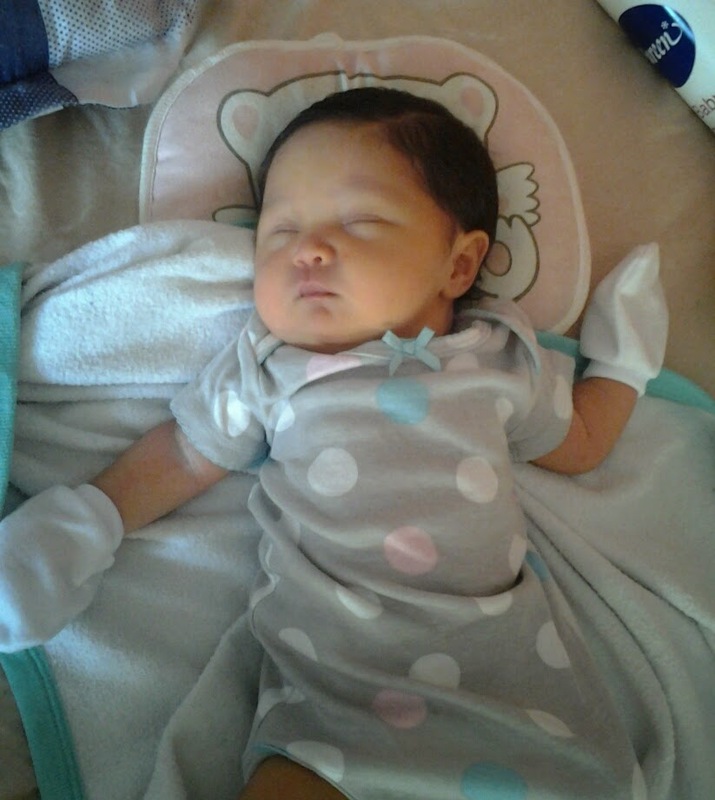 she is so adorable, little Juhd should be very proud, congrats! I'm very happy for you. And I got Qomar means moon since it's pretty much the Arabic Qamar. Alhamdulillah. Congratulations on the new born. Wow, your experience was dreadful indeed. I just gave birth almost 7 months ago too. He is my second child and the birth experience was wonderful although going through confinement.with an episiotomy is not very pleasant. So since you didn't have epi, did you have any natural tear? Alhamdulillah! Congrats sis! Hihi, I am the youngest in my family, still single. So, I don't really have direct experience of delivery. But, I really do love reading gynecology's stuffs. :) Glad it was normal. Take care sis. May Allah gives good health to you and Qomar, always. Assalamu alaikum my goodness what a story. Alhamdulilah though good job sister.